I’m quite excited about the Next Generation Science Standards (NGSS)! We’re shifting from teaching science and math topics in silos to integrating the disciplines. It’s a challenge…but I’m up for it! 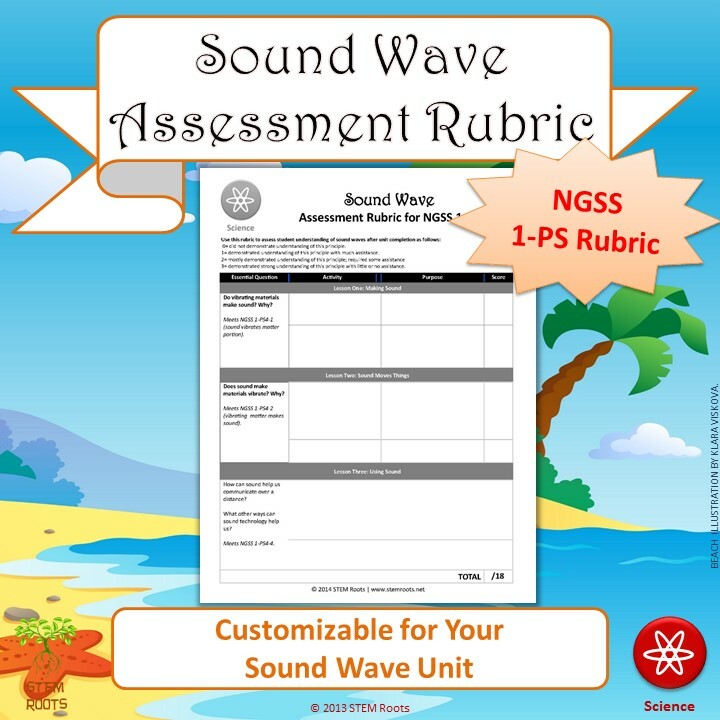 This Sound Wave Rubric freebie from my STEM Roots TpT store is aligned to NGSS. Each of the essential questions on the left correspond to one of the first grade Physical Science (1-PS) standards. What: The Next Generation Science Standards are “a collaborative state-led effort” to fundamentally shift how we teach science, standardize content and practices, and, ultimately, transform science education in the United States. The centerpiece of the NGSS effort is the Next Generation Science Standards. It integrates multiple concepts, disciplines and practices–and requires students to apply scientific processes rather than simply memorize facts. Who: Twenty-six states, a 41-member writing team and lead partners (like the The National Research Council, the National Science Teachers Association, the American Association for the Advancement of Science, and Achieve) are all on the roll. Why: To improve science education, integrate content from multiple disciplines, and fundamentally, to prepare the next generation to be college- and career-ready for the sciences. Where: Twenty-six states lead the effort and as many as 40 states have shown interest in adoption. If you teach in the U.S. of A., it is quite likely that NGSS is coming to you! When: The standards have been finalized and individual states are considering them for adoption. The implementation schedule varies by state. But, some states have already adopted and are beginning implementation as early as the 2014-15 school year with many more anticipated in the coming years. Here is a list of states and their adoption status. How: NGSS requires a fundamental shift in how we teach science. Students are active in scientific and engineering processes; they work hands-on with technology. The Common Core—math, reading and writing—are integrated into the science curriculum. It’s the how that I’m interested and in my upcoming blog posts we’ll explore how to approach NGSS. What about you? Has your state already adopted NGSS? How do you feel about NGSS so far?